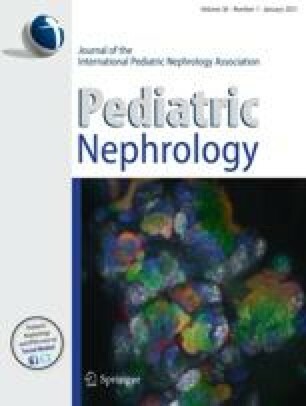 Two hundred and twenty Argentinian primary school children (122 boys, 98 girls, aged 6 – 13 years) were studied to establish reference values of 24-h urinary calcium excretion (UCa) and calcium/creatinine ratio (Ca/Cr) in 24-h urine collections and in first-morning urine samples. Mean UCa excretion was 2.05±1.40 mg/kg per day and the 95th percentile was 4.74 mg/kg per day. UCa excretion was higher in boys than girls (2.33±1.47 and 1.70±1.24 mg/kg per day respectively, P <0.001). Statistically significant differences were found between the 6- to 9-year and the 10- to 13-year age groups (2.37±1.49 vs. 1.73±1.25 mg/kg per day, P <0.001). Mean Ca/Cr ratios in 24-h collections and in first-morning urine samples were 0.129±0.086 and 0.105±0.079 for the group overall (P <0.001). The Ca/Cr ratio in the first-morning urine sample correlated poorly with the 24-h calcium excretion, suggesting that the Ca/Cr ratio in first-morning urine samples cannot replace the 24-h measurement.